So, magnificently I was linked on AOL yesterday, hence the 14,000 readers and 40,000 hits. I am still amazed, even if it was a fluke! There were a lot of discussions, and one question e-mailed to me, about DIY headboards and canopies. I figured I would do a post with some more ideas on creative ways to create a dramatic bed without having to actually BUY a bed. 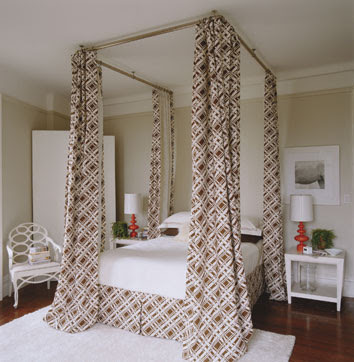 This bed features canopy curtains…without a canopy bed. 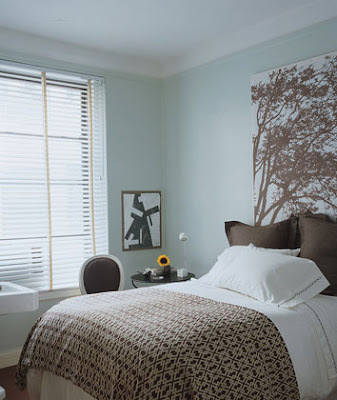 You can recreate this yourself my using simple window treatment rods attached to the ceiling. Measure floor to ceiling and order curtains in that length with O-ring clips to attach them to the rods. That way you can close the drapes if you wish. 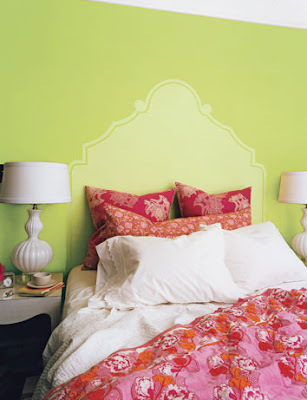 This headboard is painted right on the wall! This will look best as they did it here, in 2 shades of the same color- otherwise it will look juvenile. This will take a steady hand and patience! This is the most simple look- all you need is some really interesting fabric in a large graphic print, stretcher bars from any art supple store and a staple gun. Make sure the fabric is centered and level and wrap around the bars and staple to the back. Hand above the bed and voila! 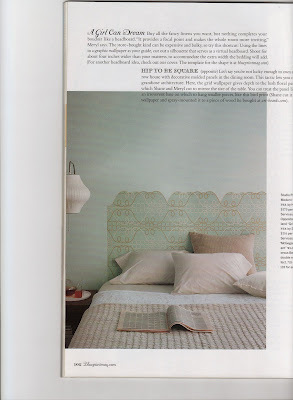 This is similar to the painted headboard, but using wallpaper! Cut an interesting pattern along one lengthwise edge of a roll of wallpaper and paste to the wall. 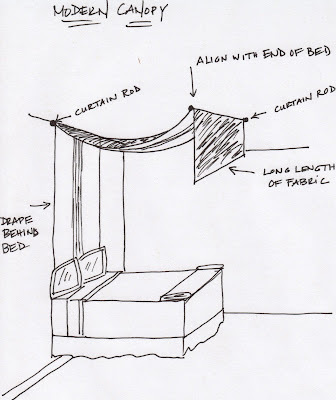 I received one specific question from a reader about creating a canopy above the bed. This picture above is a very modern way to do it (and quite simple). 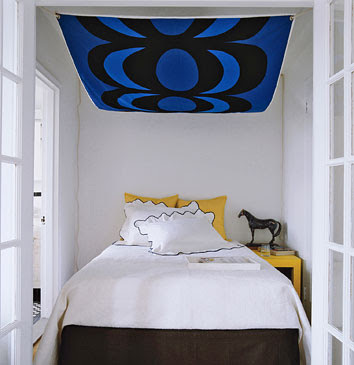 All they did was screw 4 small hooks in the four corners of the ceiling above the bed and hung a length of Marimekko fabric. I love the large graphic for this kind of use. My modification below, is a little more involved, but I prefer it. Please pardon my quick sketch! You’ll need two drapery rods and a very long length of fabric. If you feel up to it, I like the idea of sewing together a solid on one side and a pattern on the other (for the under side). install one bar right above the head of the bed and one at the foot and run the fabric behind the bed (you can tack it to the wall near the floor so it doesn’t move). I think it’s a beautiful and cheap way to create a very romantic and dramatic look. I am thinking of making Friday a “reader design question” day where I answer a specific design dilemma from one of you. Let me know if you like that idea! Hi Erin!!! I actually found you through the AOL link!!! Love your blog and have added it to my favorites to visit!!! I LOVE this canopy idea and would love to feature it in my show, Decor It Yourself on Threadbanger.com. Would you mind if I featured this idea? Thanks for the inspiration. Question, I am planning on purchasing a low profile bed and want to add some drama to the room with a canopy. However, there is a ceiling fan in the middle of my room :(. Any suggestions for working around a ceiling fan? ?